Our Old Miners Cottage: In the news! Well, that's one way to put it! The Stawell Climate Action Group organised a Sustainable Homes tour, and our old miners cottage was one of the three homes shown! We were both very nervous as around 30 people came through our front gate. We showed off our veggie garden, water tanks, solar hot water and solar system, the worm farm and compost bays, as well as the partially completed chook house. I think it went pretty well, considering we've never done anything like it before! So, we've made it into the local paper. Unfortunately the Stawell Times News misunderstood "worm farm" and called it a "warm farm" throughout the article. Oops. Never mind! 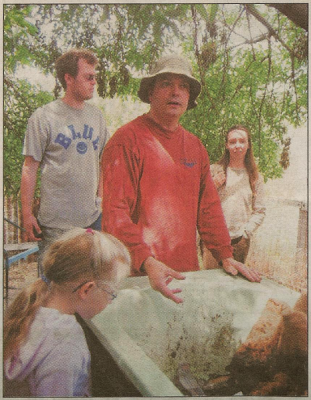 So, here's the picture of Marty and me in the newspaper! .. and for the full article, click the thumbnail below. Celebrity status! Don't let it go to your warm heads! Way to go. That is really neat. It shows people that yes, they can be self-sustaining and literally live off the land. That is so cool.